The Fellowship was fortunate enough to obtain a copy of POWER UP #1 from BOOM! Box. Kate Leth writes and Matt Cummings draws and colors. Amie works in a pet shop. Her boss is a little overbearing, but otherwise she’s pretty happy with her life. She enjoys her work and she’s got good friends. One day she’s left alone in the shop for a few minutes and she and Silas the goldfish are struck by some kind of weird light beam. Then a strangely well-dressed tentacle dude walks in and attacks her, but they manage to fight him off. And no one saw anything. Amie is a really likeable character; she’s got a great sense of self, combining inner strength with a bit of eccentricity. And something weird is definitely going on, but I’m not spoiling this one. There’s a cool fantasy story in there, and big things are coming. The art does a great job of contrasting the mundane from the fantasy (and the tentacle dude looks really cool!). This is a fun, friendly little story that works for any fantasy fan, young or old. It would be a great choice for sharing a comic with a friend, so pick up a copy. 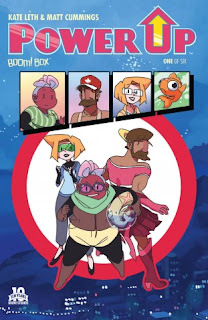 POWER UP #1 is available now at your FLCS or at boom-studios.com.